Brand new for 2018, BlackVue's B-124 Power Magic Ultra Battery Pack is the newest battery pack that is fast-charging, long-lasting and connected! Doubling the runtime of the previous-generation B-112 battery pack, the B-124 Power Magic Ultra Battery functions the same way: it recharges when your engine is running on and powers your dashcam when ignition is off. Fast Charging: the Power Magic Ultra Battery reaches a full charge in a record 40 minutes when hardwired (80 minutes if connected to the cigarette lighter socket). Long lasting: Parking Mode can last more than 24 hours with a single-channel BlackVue. Connected: Compatible with the free BlackVue Battery Manager app. Simple installation: just plug the battery into the cigarette lighter socket of your vehicle. Charging current: 5A – Charging time: approx. 80 minutes. Hardwired installation: For fastest charging speed, connect the battery to the fuse panel. Charging current: 9A – Charging time: approx. 40 minutes. The B-124 Ultra Battery Pack supports Bluetooth for compatibility with the free dedicated BlackVue Battery Manager app (iOS/Android). When charging, the app displays charge percentage, charging voltage and expected remaining time until full charge. When ignition is off, the app informs you of the expected Parking Mode remaining time until depletion, based on the dashcam’s power consumption. 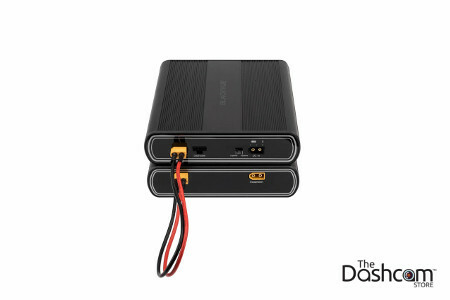 Expansion port: you can connect a B-124E (Expansion) Battery Pack to the B-124 Ultra Battery to more than double or even triple your capacity and Parking Mode time. The Expansion Battery (B-124E) can store up to 6600mAh of power, so 10% more power than the Ultra Battery. Multiple Expansion Battery units can be connected in sequence to provide even larger capacity. Click here or on the image below to learn more about the B-124E Ultra Battery Expansion Pack that is available for use with the B-124 Ultra Battery Pack. OEM equipment from PittaSoft BlackVue. Professional installation is recommended.